I absolutely love fishing and some of my best and oldest memories involve sitting in a boat hoping to catch some fish. However, as much fun as it might be to simply sit there and be men while harvesting your dinner - it's essential that we are good stewards of this important natural resource. This is even more challenging when you travel to new areas where you might be less familiar with regulations and are ultimately farther away from your kitchen. 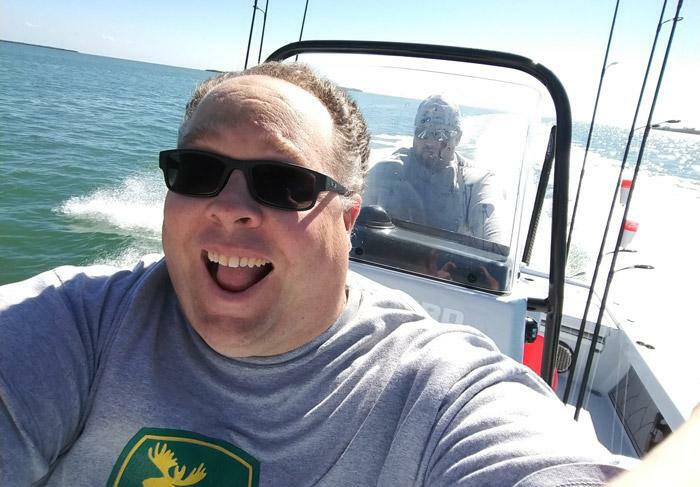 However, here are some tips and advice that I've learned over the years to help men be more responsible fishermen when they travel. With Father's Day coming up soon, not only is a great time to get out on the water but it's an opportunity to share skills with the next generation. While some dismiss certain regulations as simply for revenue generation, generally they are essential to keeping the waterways safe and the fish plentiful. Ignorance of a law is no excuse for not following it. For instance, that "fishing license" might seem like a waste of money. However, the money helps fund fish and wildlife teams that are dedicated to keeping the lakes, rivers, and other waterways a thriving environment for your favorite catch. In the past, this has been one of my biggest reservations about going on fishing charters and other excursions when I travel. I feel like if you are going to hunt or fish - you should be prepared to honor the pray by enjoying its spirit. Unfortunately, when you travel that's not always easy. Plus, putting fish in freezer bags and constantly refreshing the ice is a chore and can be a mess as well as risking the fish going bad. Even worse is that at best it's only a short-term solution. One of my new writers - Chris - tested the GameSaver® out recently, and I was completely impressed. It was ridiculously easy to set up and intuitive to get working. Plus, it was very portable down to a storage area for extra Heat-Seal Rolls as well as a self-contained cord system. It was also super fast. Obviously, you don't have a giant flash freezer in the back of your truck. 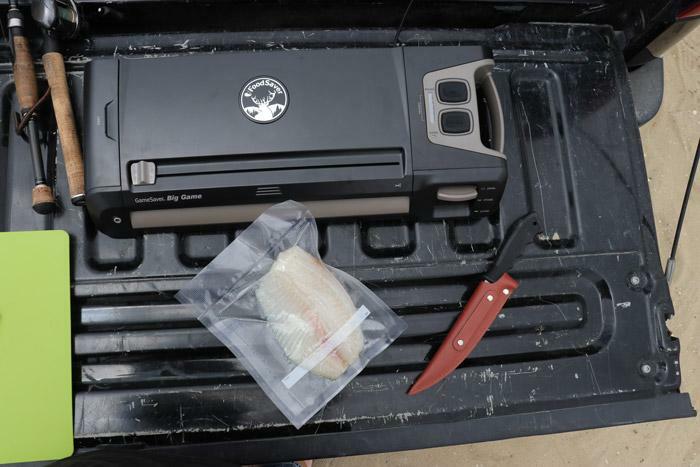 However, with the FoodSaver® GameSaver® you can keep your catch fresh by vacuum sealing it only moments after filleting. 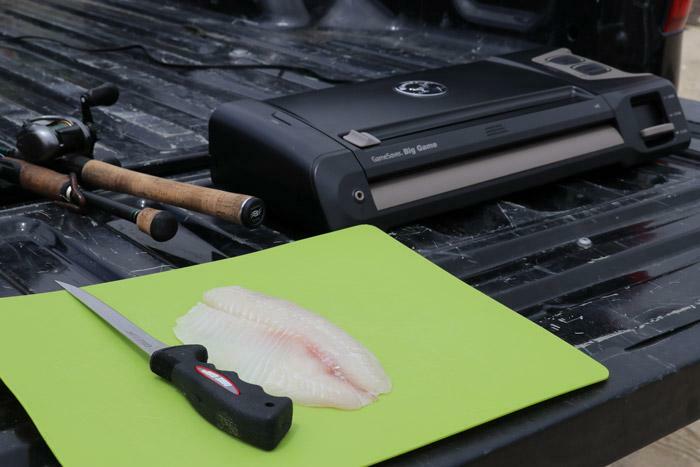 The GameSaver® 710 Big Game™ Vacuum Sealing System® is specifically designed to be mobile so that you can preserve game and fish right on the tailgate of your truck or on a table at the campsite. It has a nice carry handle and a 12-volt "cigarette adapter" plug with a long cable for use with cars, boats, and RV's. It also has an accessory port for connecting to other FoodSaver® containers and accessories. You can buy the Big Game™ as well as Heat-Seal Rolls at most Walmart locations or online. It's designed to offer 80 consecutive seals so you can vacuum seal up to 240 pounds of game and keep it fresh up to five times longer. For instance, while fish such as salmon and tuna would only last three months using a traditional freezer storage, with the Big Game™ you can preserve it for 12-18 months! What's even better about this system is that you can actually help preserve items at home ... and bring to the campsite too. For instance, in addition to vacuum seal bags, they also have jars, bottles, and containers too. This means that you can not only preserve your fish for taking home ... but you can prepare food at home and keep your pre-cut vegetables and marinades fresh till you get to the camp too. To complete the primal man cycle of catching and eating your food you really need to track, catch, prepare, cook, and eat your food. However, when traveling that isn't always possible. Ideally, you'll have a vacation rental with a grill or a campfire to cook over. Sadly though, most hotels aren't equipped with a kitchen. That's why I love to support restaurants where you can bring your filet in for them to prepare. This is almost as good as cooking it yourself and you can still honor the natural spirit of the fish by enjoying it's flesh. Depending where you choose to drop your line, some fish can be completely off-limits since they are protected. Others such as tarpon have special handling conditions that are important to respect. While you should always check regulations before you travel to go fishing in a new area, you should also educate yourself by bringing a guide book to refer to as well. 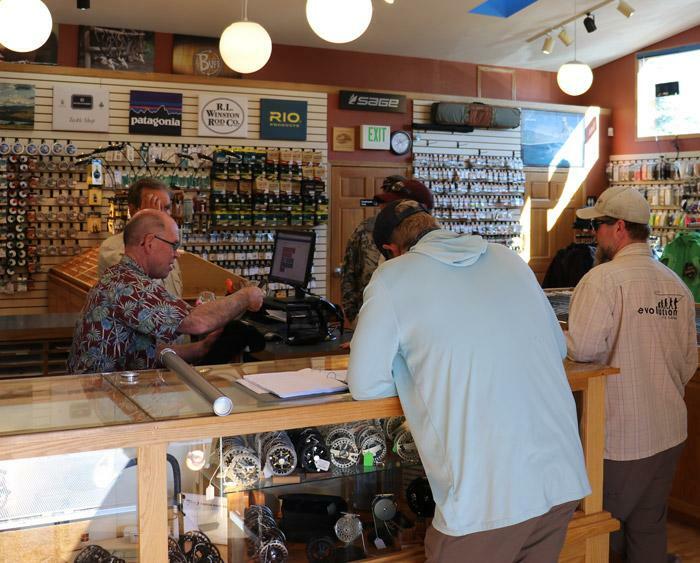 I know last year when I was fishing in Montana, our guide from Montana Fly Fishing Guides was an excellent resource. He knew not only what the fish was but each species density in that part of the river. That helped not only get us excited about each individual catch but also make it easier to throw the rare ones back so another guy can catch it tomorrow. 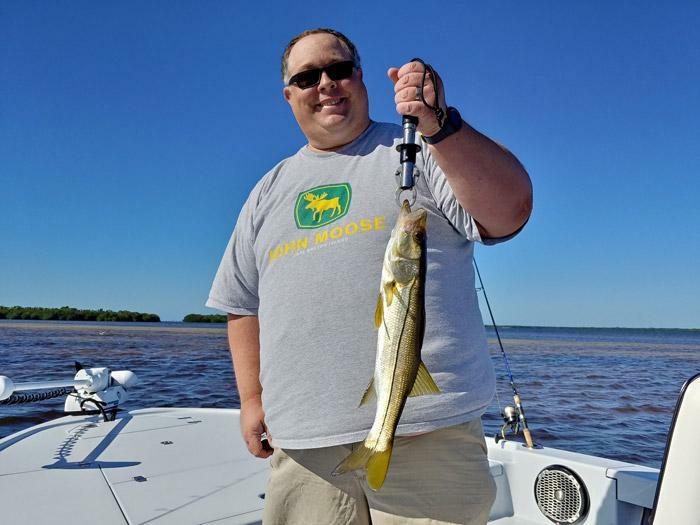 Honestly the same can be said for most other guides I've been with as well including Captain Jay who I fished with in Punta Gorda / Charlotte Harbor in Florida. You enjoy fishing right? Future generations - as well as the guy next week should have the same opportunity too! No matter what your day on the water might feel like - feast or famine, make sure to follow regulations. 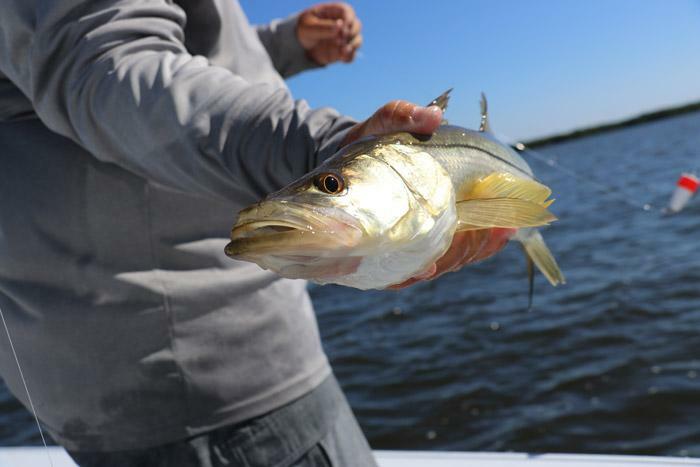 While it might be exciting to keep more fish than your limit or keep that one "just under" the limit, throw it back. While you can say that it's just one fish there's a reason why limits exist. That's sort of a paradox that non-fishermen and non-hunters often fail to understand. Fishermen and hunters are among some of the most focused conservationists out there. They are in-tune with natural cycles and most of us look forward to doing what we can to preserve nature's bounty for future generations ... as well as next year's guys getaway trip to that favorite fishing spot! You already know that each place you visit is unique since that's why you are there - to try and catch different types of fish than you have back home. Unfortunately, what might be a harmless algae or organism in your home lake might represent a deadly invasion at another. This is most important when hauling a boat from one area to the next but you should similarly clean your other gear too so that you can prevent contamination. Aquatic Invasive Species or AIS are no joke. They come in various forms from microscopic pathogens to larger organisms. That makes it essential that you clean your gear - including boat, boots, and even trailer to ensure that you don't accidentally bring something home with you or contaminate that pristine lake you spent hours driving to. Fishing is one of the most fun activities that you can enjoy with another man. It's a great way for fathers and sons to bond as well as celebrate brotherhood with other guys as well. Even though "catch and release" doesn't kill fish directly, it can still injure them if you aren't careful. 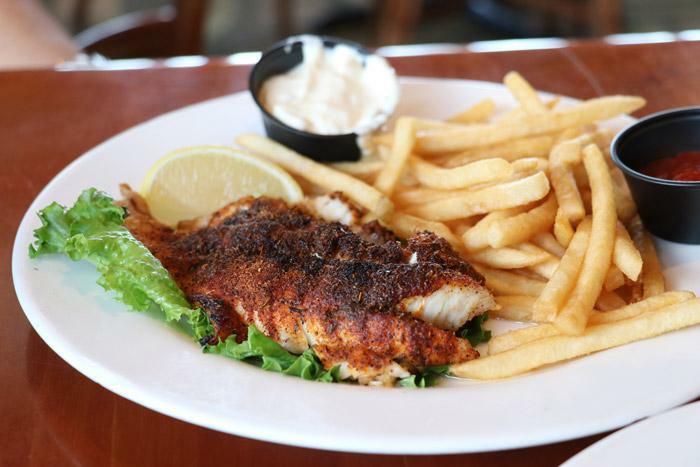 Part of being a responsible fisherman is respecting your catch. This includes choosing to use barbless hooks and using a tool to remove hooks gently. Similarly you should keep the fish in the water or wet your hands while detaching it from the hook or at least wet your hands so it is less disruptive to the scales. Also make sure to avoid damaging the eyes or gills and be careful to not squeeze the fish too hard. All of those things can cause soft tissue damage that may cause the fish to drown even after being released back into the water. You should also use a net to lift the fish out of the water so as to avoid having all of it's weight hanging on the hook and line. When you are ready to release the fish, hold it in the water and move it slowly back and forth to have water flow across the gills. Once it has a chance to revive, you'll know it's ready to go so release it gently. Most fishermen I meet are pretty respectful of each other but as a reminder it's important to not crowd someone's space. This is a courtesy so everyone can enjoy some peace on the water but also a practical concern so lines don't get tangled. Last but not least, respect your environment. The fish depend on having clean habitat to live and grow in. This means that you should be a good environmental steward by watching for any gas, oil, or bilge leaks from your boat and be sure to secure any trash that might blow into the water. Similarly, make sure that you should properly dispose of any broken lines and lures. Look for trash cans with covers so that they aren't mistakenly picked up by birds or blown into the water where fish and other animals could get tangled. 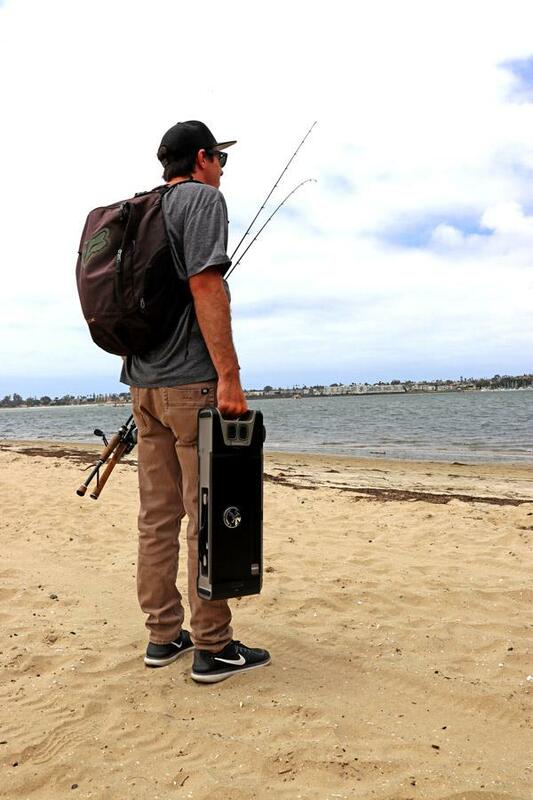 Enjoy Yourself and Have a Great Time Fishing! This is probably the most important thing to remember. Fishing is a fun and enjoyable pastime that has been shared between fathers, sons, and brothers for generations. Now, it's your turn to experience the thrill of catching and ultimately eating your own dinner. Enjoy the experience respectfully and responsibly!